(Nanowerk News) It all started out with an observation that ETH scientists made about two years ago with a special fluorescent protein isolated from corals: Dendra 2, which fluoresces green. Light can be used to change its molecular structure so that it switches its colour to red. The researchers had discovered a new way for this colour switch: first, it is briefly excited with a pulse of blue laser light and then illuminated immediately with near-infrared light. Applications for this two-phase colour switch include fluorescence microscopy, which makes it possible to see a three-dimensional, precisely defined point (e.g. a single cell) in the tissue of an organism). An international team of researchers led by Periklis Pantazis, a professor in the Department of Biosystems Science and Engineering (D-BSSE) at ETH Zurich in Basel, has now explained this two-phase colour switch mechanism (Angewandte Chemie, "Rational Engineering of Photoconvertible Fluorescent Proteins for Dual-Color Fluorescence Nanoscopy Enabled by a Triplet-State Mechanism of Primed Conversion"). The scientists refer to this as "primed conversion". The new knowledge is allowing the researchers to modify other light-sensitive proteins so that they can also be excited in two phases. The researchers from ETH Zurich, the Karlsruhe Institute of Technology, and the Janelia Research Campus in Ashburn, Virginia, closely examined the proteins activated with blue light and succeeded in showing that these proteins enter an excited state lasting several milliseconds. "That's relatively long," explains Pantazis. "Other fluorescence phenomena are much shorter." The scientists were also able to show that this state is a case of a phenomenon known from quantum chemistry - a "triplet state". After about five milliseconds, the fluorescent protein Dendra 2 returns to its ground state. Primed conversion happens only if the second phase - the illumination with near-infrared light - occurs within the triplet time window. The duration of the triplet state depends greatly on the stability of the fluorescent protein. This, in turn, depends on the exact sequence of protein building blocks (amino acids), which is why the scientists modified the Dendra 2 amino acid sequence in several spots. They then did the same with another fluorescent protein, Eos. Until now, this protein could not be excited in two phases. It is documented in the scientific literature that these locations are essential for the triplet state. The scientists measured the duration of the triplet state with all of the new proteins. This state was extended significantly in several of the proteins tested. The scientists were also able to modify the Eos protein so that it too could be activated in two phases. They succeeded in doing this with another six proteins that had never been activated in two phases before. "The modified proteins weren't just made switchable in two phases for the first time; they're also more stable and therefore fluoresce more intensely," says Manuel Mohr, a doctoral student in Pantazis's group and lead author of the study. The scientists made the original discovery with a laser not conventionally available, using light in the near-infrared range. Today, however, the scientists have demonstrated that the effect can also be achieved using the same conventional red lasers found in every fluorescence microscope. In other words, primed conversion is possible with any fluorescence microscope. Primed conversion can be used in microscopy in order to mark a narrowly defined point in a tissue sample. 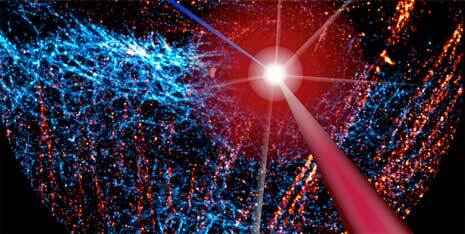 The scientists do this by aiming a blue and red laser beam into the tissue so that the beams cross at a single point. Primed conversion occurs only at this intersection. "Because neither blue nor red laser light have a toxic effect, the method is ideal for living organisms," says Pantazis. Applications with other microscopy techniques may also be possible, including super-resolution microscopy, which has been around for several years now. "We now know how to modify photoconvertible proteins to make them switch in two phases," says Pantazis. The researchers have patented this discovery. The ETH scientists are working together with protein experts to modify other fluorescent proteins used in microscopy in the same way. The researchers recently modified proteins so that they can be split off from a gene-activating messenger in a way that allows them to be light-activated with two colours. For example, they could illuminate tissue with a blue and red beam intersecting at a single point, making it possible to activate specific genes in a single cell of the tissue. Proteins that detect calcium can be modified in this way as well and could potentially be used for 3D brain mapping. Biologists can ultimately use the new technique for other functional analyses in 3D: ETH Zurich has already issued several licences for the patent, including to a start-up that plans to develop a DNA sequencing technique using a 3D matrix.